Don’t miss the opportunity to represent your TITAN PRIDE and display the artistic skill & talent that is being developed & nurtured in our Visual Arts Department! p.s. some have prizes too! National PTA Reflections welcomes all grades and abilities to explore and be involved in the arts. Annually, thousands of students will reflect on a common theme and create original works of art in the categories ofdance choreography, film production, literature, music composition, photography and visual arts. The world would be a better place if… is the theme for the 2014-2015 school year. This theme by Mercedes Messer of Puyallup, Washington was selected through the Reflections Theme Search Contest. When asked what inspired her theme, Mercedes said, “Our world, because I care about it and wanted to know other kids’ ideas on how we could make it a better place.” Join the search for a future theme by entering the annual Theme Search Contest. This is an amazing event! In 2014-2015, Keanne Jones won a Regional Gold Key for his mixed media drawing. 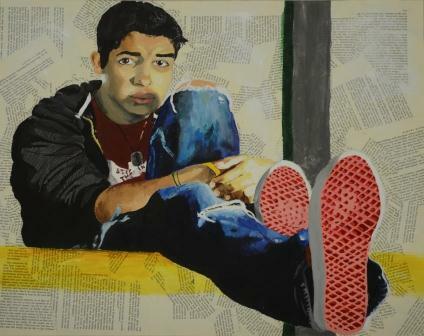 In the 2012-2013 school year, one of Northern’s AP students earned a Regional Gold Key and then was awarded a Silver Key on the national level for her mixed media painting. Through district and community support the student and I were able to attend the 2013 National Exhibition and award ceremonies at Carnegie Hall in NYC! Two of the guest speakers were Sarah Jessica Parker & Usher. (It wouldn’t be an inconvenience for me if I were to need to visit again for the sake of a student!) But, no, really, a prestigious recognition and honor indeed. Just take a look at some of the award winning work. If you would like to know more about the awards, exhibition, publication & scholarships, click here. Gia. The Wanderer, 2012. Acrylic and book print on tag board. How do I enter a work in the 2015 Scholastic Art Awards? MAKE your INTENTIONS KNOWN! Let your visual arts teacher know by Monday, December 15th. SIGN- UP! 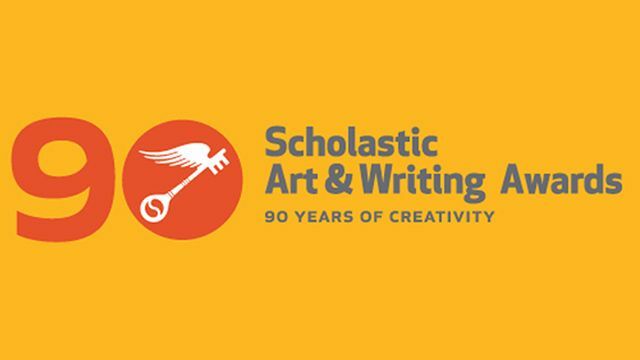 Submissions for the 2015 Scholastic Art & Writing Awards will begin on September 15, 2014. To get started, visit our sign up page. Be sure that you have your school zip code handy so that we can get you the guidelines and deadline for your region. CREATE! Make your work and uploaded it to you Scholastic Awards Account! STAMP IT & SEND IT! When you have uploaded your work, print your submission forms. Make sure to have them signed by a parent/guardian and an educator, and then mail them to your Regional Program. Read the mailing instructions for your regional program carefully. The last day to submit is Wednesday, January 7th by 5pm. COST! $5.00. Eligibility! Any public, private, parochial or home-school student in grades 7 – 12 in the U.S., Canada or an American school abroad may participate in the Awards. Category Descriptions!…waiting for it to be posted for the 2014-2015 year. What is Originality?The nature of creative reinvention makes originality hard to define. Works of high originality challenge conventions, blur the boundaries between genres, and shift jurors’ notions of how a particular concept or emotion can be expressed. We encourage our jurors to look for works of art and writing that surprise them. Many of the works submitted to the Awards begin as classroom assignments. A functional definition of originality is work that goes beyond the classroom assignment and demands its own reason to exist in the world. What is Technical Skill? Each year, we bring thousands of professional artists, writers, educators, and scholars together, with functional expertise in specific genres, to evaluate the skills demonstrated by students who submit works to the Awards. Technical skill is judged on how it is used to advance an original perspective or a personal vision or voice. Rather than being evaluated for specific skill proficiencies, students will be evaluated on how they used their skills to create something unique, powerful, and innovative. What is Personal Vision or Voice? We all know what the personal visions and voices of Awards alumni Andy Warhol, Truman Capote, Richard Avedon, and Sylvia Plath looked and sounded like when they became professional artists and writers. But what did their works look and sound like when they were teenagers? This is precisely the question we ask our jurors to consider during the judging process. It’s no coincidence that the Awards have identified some of the most important creative minds of the past nine decades. We are in the business of identifying the self-possessed, unique voices and visions of teenage artists and writers.